David Bebbington’s 1989 book, Evangelicalism in Modern Britain: A History from the 1730s to the 1980s, put forth the idea that evangelical religion is the result of transatlantic revival in the 1730s, and that it took a working together attitude toward the Enlightenment rather than a contradictory one. 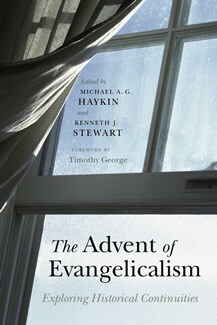 Today, Bebbington’s thesis has gained international acceptance, and scholars from Europe and North America present a review of its primary arguments and conclusions here in The Advent of Evangelicalism. Contributors include: David W. Bebbington, Joel R. Beeke, John Coffey, Timothy George, Crawford Gribben, Michael A. G. Haykin, Paul Helm, D. Bruce Hindmarsh, David Ceri Jones, Thomas S. Kidd, Timothy Larsen, Cameron A. MacKenzie, A. T. B. McGowan, D. Densil Morgan, Ashley Null, Ian J. Shaw, Kenneth J. Stewart, Douglas A. Sweeney, Garry J. Williams, and Brandon G. Withrow.